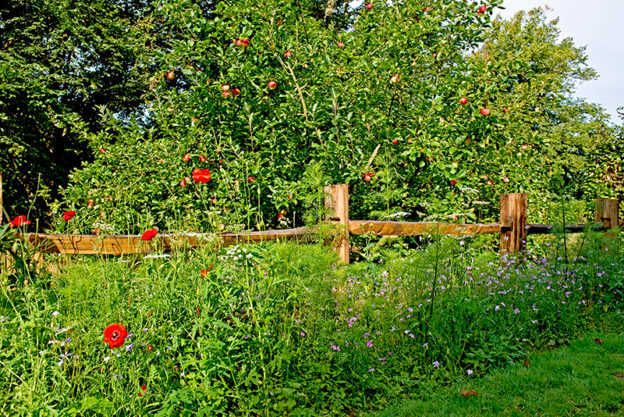 Sandwiched between the Wildlife Garden and the Butterfly Garden there are four apple trees, There are two Worcester Pearmain and two Ellison’s Orange, planted about 20 years ago. Worcester Pearmain is an early season eating apple, supposed to have a strawberry flavour. Ours tend to ripen from August to September and shine out a rosy red amongst the dark green leaves. They also look fantastic in spring when in blossom. Ellison’s Orange is another eater and an offspring of the more famous Cox’s Orange Pippin. Ripening from October it is crisp and juicy. Most of our apples are left for the birds, they usually start to tuck in around November if the wasps have left them any. In spring 2016 we planted a Medlar and a Quince. Both old fashioned trees but interesting for their history as well as their character. Another extra is the chestnut fence put in in spring 2016. The chestnut came from the Blean Woodland Complex NNR in Kent, managed to create suitable habitat for Heath Fritillary butterflies. Flowering for the summer of 2016 under the Wocester Pearmain was an annual flower mixture put together by ‘Pictorial Meadows’. We chose their ‘Pastel Mix’, sowed it rather late but by late August/September it finally flowered and hung on until September. We struggled with the cold early summer, moles, deer, slugs and pigeons and will do better in 2017!